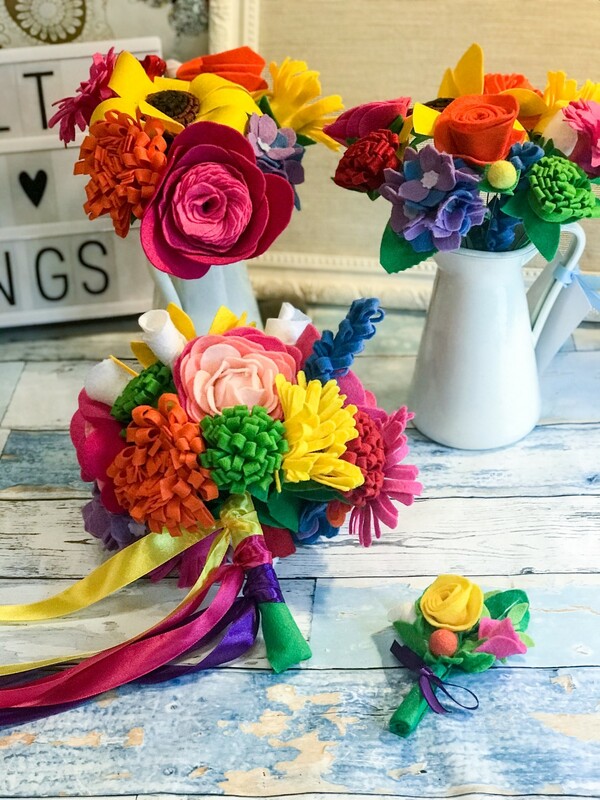 Today I am thrilled to spotlight on Felt’n’Fings, an emporium of beautiful felt creations and accessories including felt flower bouquets, buttonholes, floral decor, flower crowns and headbands. Hi! 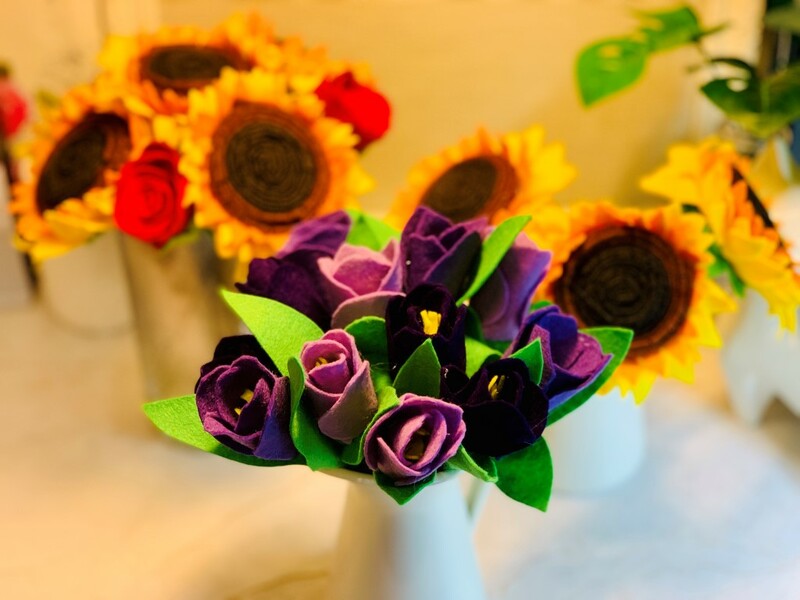 I’m Anya and I make felt flowers (and wands, and a few other fings)! As long as I can remember I have loved making things. Looking back, (and after digging out my childhood makes from the loft) I used to make lots of things with felt or embroidery and as an adult I often found myself keen to make something, so for quite a while I would always have a tapestry or some embroidery on the go. 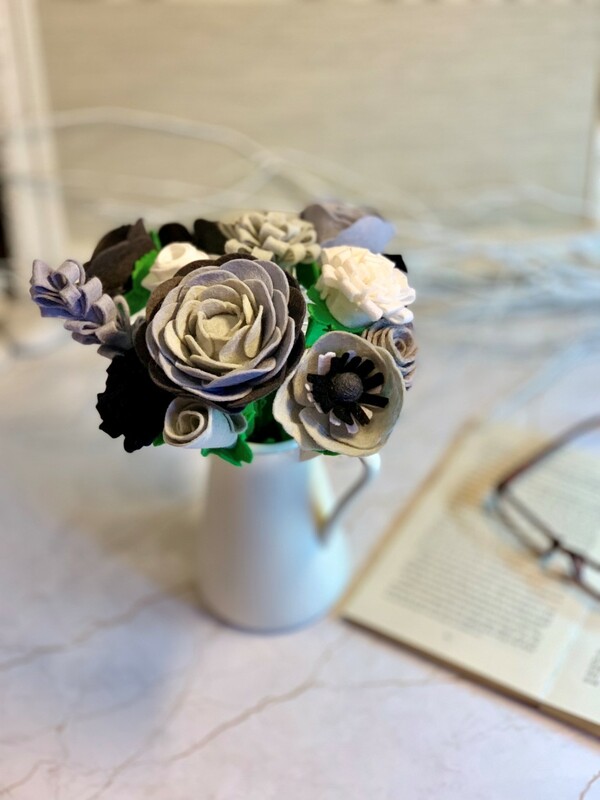 When I had to plan my wedding in 2017, I knew immediately I wanted to make a lot of the decorations for it, and after giving it a lot of thought, I also decided (possibly fuelled by Pinterest) that I should also make all my flowers, from felt. This was possibly a completely bonkers undertaking, as not only did I decide to make my bouquet, my bridesmaids’ bouquets, my flower crown and all the buttonholes. I also thought I’d make ALL the flowers for the tables and décor in the marquee. 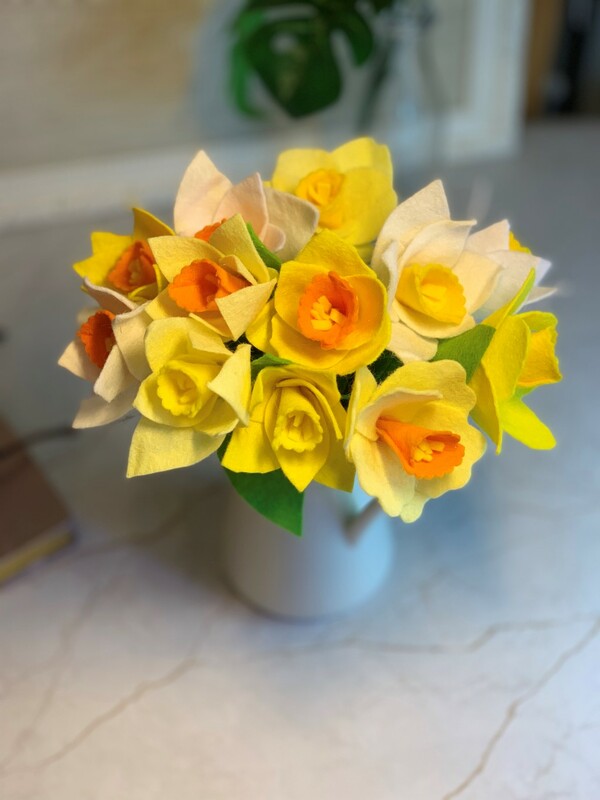 I blame Pinterest entirely for my enthusiasm, especially since despite making many things from felt as a child, I had never ever made flowers! After many attempts, lots of swearing while getting to grips with glue guns, I started to make headway. As a bride, having Facebook groups for ideas and support is essential, and when I shared my flowers with the groups so many brides exclaimed the desire to have flowers like mine. This prompted a seedling of an idea started to form, and I realised I could make the flowers for others! At the start of 2018 I launched my Etsy shop properly, and since then have had the honour of making many bouquets for excited brides to be as well as flowers as gifts and home decor. Colour. Always colour. I love colour and I am quite OCD about how coloured things, like pens, pencils and felt are ordered! But when it comes to creating flowers and bouquets, I love seeing colours work together like a symphony. I always look at nature, obviously, because in many cases I am representing nature in felt, but I also design flowers that may not exist in nature but are based on natural forms. Yes and no! 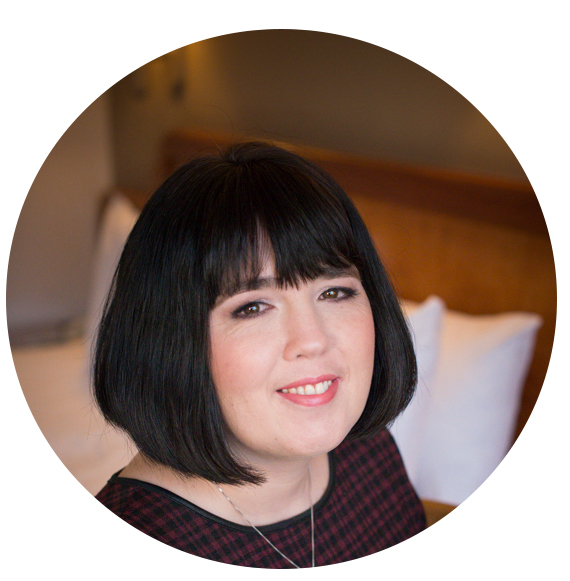 I think in the wedding industry there are always new trends, and there are bound to be brides who want the new big thing, particularly in colour themes. However, so far, most of my brides have had their own unique style, not necessarily bound by trends and that’s often why they come to me, because they don’t want traditional flowers and felt can offer them something different. Do you have a favourite wedding style? Colourful! The more colour the better! My own wedding was a colourful festival crazy unicorn rainbow of a wedding, so anything that celebrates with lots of colour is glorious! Mainly that I can commute to my studio in one minute, in my pyjamas with my cat. No, seriously I love the making and designing and creating, and then the feedback is the one thing that makes it all worthwhile. Because I keep my brides (and all clients who order custom flowers from me) informed every step of the way, it means I get to see how much they love their flowers. I love bringing a smile to other people’s faces and brightening their every day. 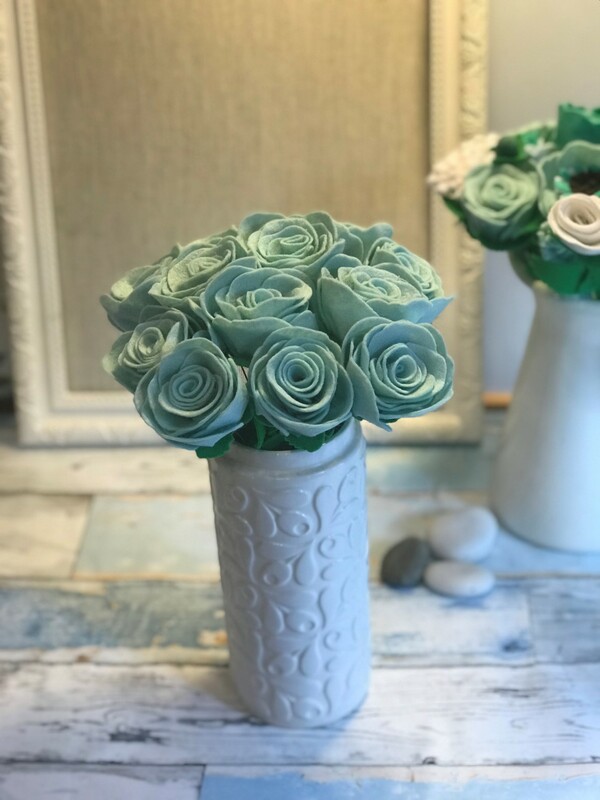 Because the flowers are felt, they last forever, so it’s such a wonderful keepsake and knowing I can give that to someone through my creations is wonderful. What do you do in your chill time/perfect day off? A nice long walk in the countryside, preferably a forest, then a lovely hot bath and snuggle on the sofa with husband and cats (on a cold day), or chill on the terrace with a nice iced coffee! Because Felt + Fings is still a young company it feels crazy to even think about great achievements, but just a few months after launching I was selected as one of the Top 100 Small Businesses in Small Business Saturday and attended an event at the House of Lords to celebrate small businesses in the UK, which was amazing. My Christmas wreath was also featured on ITV’s This Morning in December, which was certainly a highlight I didn’t expect! 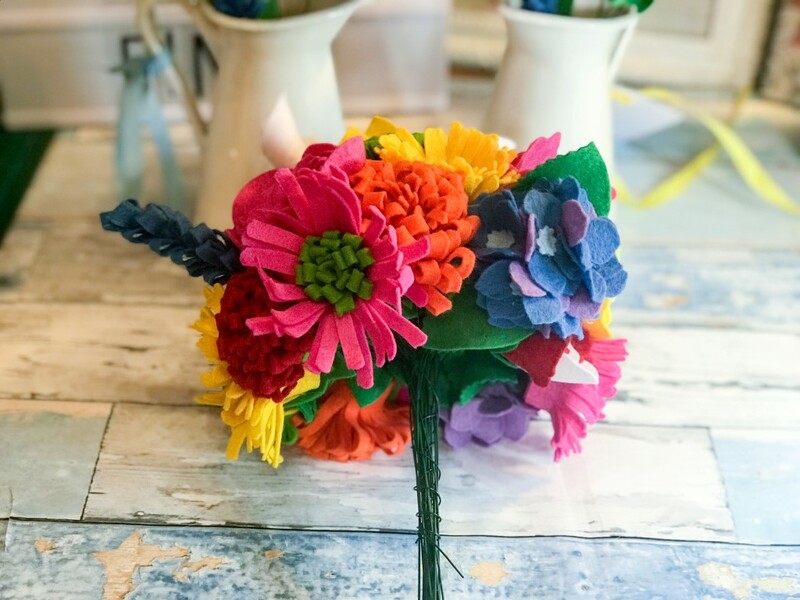 I simply want to continue to bring the glory of stunning colourful felt flowers into everyone’s lives to brighten their everyday, whether it be a keepsake wedding bouquet, a Mother’s Day gift, or the finishing touches to someone’s newly furnished room. 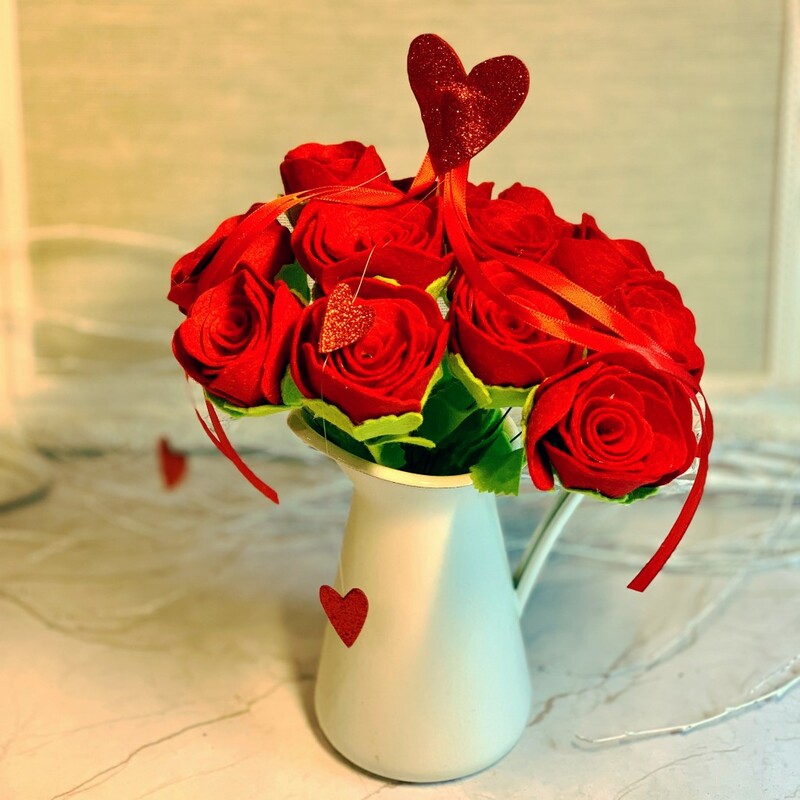 In the short term I am planning to launch a line of pre-made wedding bouquets in popular designs (sunflowers and roses, peonies and roses etc) for brides who don’t have the time to order a bespoke bouquet. 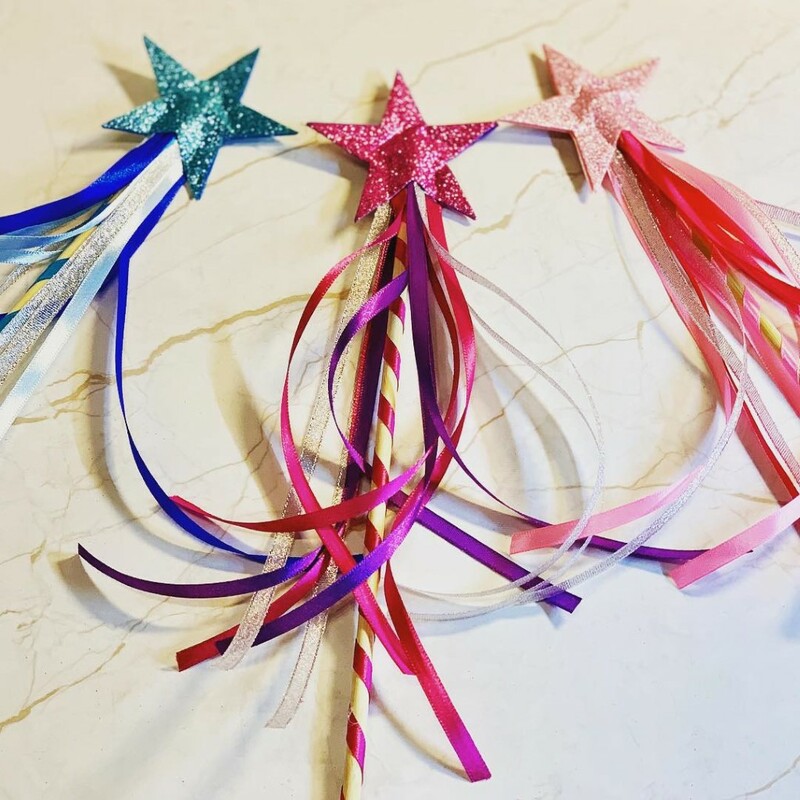 I’ll also have new wands (perfect for flower girls) and new flower bunches for gifting. The company will always be a small entrepreneurial business, run by me, with everything made by me. I don’t have massive goals to be a multinational brand, the beauty of ordering from me is that you know I’m the one making and caring about your flowers, and that will always be the case. 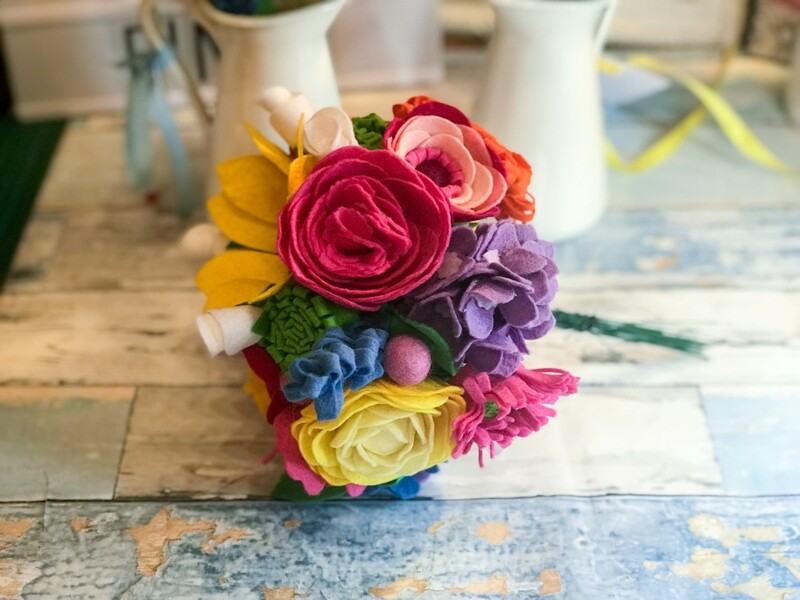 Thank you so much to Anya for sharing her quirky felt wedding bouquets, decor and wedding accessories. There is no better day than your Wedding Day to do what you love and self express. 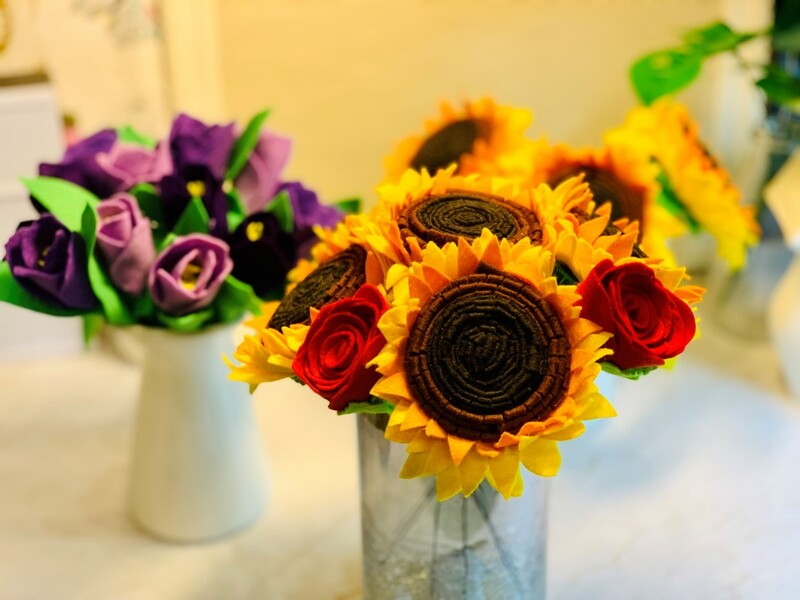 Your Big Day should be a celebration of what makes you an individual, and these amazing felt creations break free from constriction and the conventional letting you shine.